As a classroom teacher, I often found myself hurried, plagued with classroom thoughts at all times of the day, and running short on time when trying to plan learning opportunities that met learning standards/curriculum needs. Not only was I trying to plan learning opportunities, but learning that utilized technology that would transform the activities within my classroom. So, when I found a tool the students like, is easy to use, and can be utilized for more than one purpose, I tend to use it, a lot. Once discovered, Google Drawing became that tool for me. Not only is it located right there in the students’ Google Drive, (no need to access the web to find), it works seamlessly with other Google Drive classroom staples, Docs and Slides. As a teacher, I was able to utilize this tool to enhance my instruction, but not nearly benefitted as much as the students. This post will share some ideas for classroom uses. All About Me Digital Posters: Because of the easiness of inserting, scaling, cropping, and adjusting images in GDrawing, this becomes a favorite for digital posters. The students can either scan and upload a self-portrait or photo of themselves, or they can also draw using the GDrawing tools. Imagine the possibilities at the beginning of the school year. Vocabulary Development: The students could create “murals” on new vocabulary learned in the classroom. Traditional “word web” activities could be included (definitions, sentences, synonyms/antonyms) but now the students can make it their own with the creative processes and image insertion capabilities. Take it up a notch by attaching these to QR codes and displaying for others to view. Mindmapping: Because this tool has collaboration capabilities through Drive, you could have students work together to create learning/thing maps to help them process their learning. Imagine the possibilities for book clubs, and specific content studies. As a classroom teacher, I was well aware of the brain research that if you allow the students to create their own mind-maps/graphic organizers, they would find a way that was meaningful to them. Understanding would, therefore, be more meaningful and reliable. Early in my teaching career, too often, I provided the students with the graphic organizer I thought was needed for the students to collect and organize their information. After studying a bit on how the brain works, through workshops and resources from Marcia Tate and Eric Jensen, I began providing early on in the school year, different mind-maps the students could use to organize and process their learning. I provided ample examples of how to use the mind-maps. But after they were all processed, they were posted in the classroom and the students could choose their own. This made their learning a little more personal and authentic. Guess where they created them? Google Drawings! They could easily be shared and used as collaboration tools! Assessment: While attending a workshop by John Antonetti, his focus was keeping student engagement alive in the classroom. One idea he gave the crowd was different strategies for assessment. Imagine having the students answer your questions on a Google Drawing. Picture this: I am working on assessing geometry within my classroom. My prompt could be, “Draw a green parallelogram”. As I’m walking around the room with my checklist, I can easily see who understands this concept. I can continue until all concepts are shown. The students are engaged and creating. These are just a few examples of how Google Drawing can be used. Do you have others you would like to share? Last week I had the opportunity to present at the Powerful Learning Conference. It is always amazing to be surrounded by educators who are passionate about their profession. To continue to be motivated to find practices, strategies, and resources to reach all learners in the classroom, despite long hours, very little gratitude, and more “stuff” added to their teaching plate is overwhelming. I am so proud to be a part of this community and so thankful my own children are loved each day by powerful, effective teachers. This year one of my presentations, Educational Trends: Teaching Outside the Box for Student Success, offered all 250 participants the opportunity to be exposed to teaching methodologies that are proving successful in classrooms globally, when used effectively. These next few posts, I will be sharing some excerpts from this presentation. The first “teaching trend” is Genius Hour. I hate the term, trend. A trend tends to incite thoughts of fleeting “fads”. But I am here to tell you, this is a powerful practice that is growing globally. It is here to stay. What makes this practice so powerful is it can be tweaked to fit the needs of your students and classroom. Genius Hour, also known as Passion Projects, 20% Time, and Innovation Time to name a few, are rapidly becoming classroom practices to engage and motivate learners of all ages. The idea is simple. Imagine a workplace, like Google, that made a deal with its employees. You give this company 100% of your effort, brainpower, love for 80% of the week, and they will give you 20% of the work week to work on ideas you are passionate about that may not necessarily fit within your job parameters. Pretty insightful, right? Imagine a world without Google Apps for Education, Google Hangouts, Google Classroom?? Now bring that idea into your classroom… You (student) give me (teacher) 100% of your effort, brainpower, love of all things school for 80% of the week, and I will let you work on something you are passionate about. (That is school appropriate.) Would that spark the interest of some of your learners? Not sure? Here is my journey with *Bobby. Every time I would present new learning materials/content to the class, he would always challenge me why this was important. It didn’t matter if the lessons were at the top of the SAMR Model in effective technology use, or something that the students were cheering so loud in appreciation for that the principal had to see if her attention and guidance was needed, *Bobby was not impressed. Nothing I did made learning fun, or relevant for *Bobby. Then I tried Genius Hour. You see, *Bobby would always tell me, regardless how many times I was clearly communicating the relevance of our learning activity, that he could go “live in the woods, hunt, and survive without knowing this stuff”. I was very sure he could. But with introduction of Genius Hour, I now used his “survival skills” to my advantage. If *Bobby gave me 100% of his effort for 80% of the week, I would let him research and create something to present to the class to show he was a “Genius” on wilderness survival skills. I had *Bobby hooked. Now to make it happen. *Bobby and I sat down and filled out a Genius Hour Contract. This is where I let *Bobby have a voice and choice in his learning, but me being the sneaky teacher that I am, inserted content standards or skill sets that still needed to be mastered by *Bobby for personal academic success. He still gets to work on what he wants, and I can insert standards to be mastered. The really tricky part is motivating *Bobby to give 100% of his time 80% of the week. If he, or any other student, was missing assignments, did poorly on assignments due to lack of effort (not because of my lack of effectiveness in teaching material: BIG DIFFERENCE!) or was a behavior issue during the week, 100% effort was NOT given. During the designated Genius Hour time, this work would be completed, redone, or behavior consequences met. If and when the work, consequences were completed, they could use the rest of the time for their Genius Hour project. Did I mention *Bobby created a guide to wilderness survival? Very easy way to tie in writing, reading, and science learning standards. This sounds great, but where do you find the time in the day? In my elementary classroom, we had whole group reading instruction everyday followed by small reading groups/independent reading time. On Thursday and Friday of each week, I would designate the last small reading group rotation as Genius Hour time. This allowed a 15-20 minute period twice a week where the students could research, write, create, investigate, and analyze information on a topic they were passionate about. I felt it was a “win-win” for everyone involved. I have seen Middle and High Schools designate one day/week or a whole week between units as this time for personalized innovation time. 2. Students and I meet and create Genius Hour Contract (this is where I have my content standards ready). Here is a list of Question Stems to help develop essential questions. 4. Teacher and student designate “check-in” days to check on student progress and blogging posts about student learning. 5. Students presents “Genius” to class. As I stated before, Genius Hour can be tweaked and modified to fit the needs of your students. Some Genius Hour projects can take a few weeks, some over a month. Some can be individual or with partners/groups. (When working with a partner group it is crucial when assigning expectations that each member has the same rigor of critical thinking/creating within the project. You don’t want one or two people doing all the work!) Never underestimate what your students can do. Even our youngest learners have passions. A Kindergarten Genius Hour will look very different, but it is possible and it is happening. Some Genius Hour projects my past students have completed: A step by step flyer on how to create bracelets using different materials; a reenactment of the Geddysburg Address using sock puppets, a video tutorial on how to use basic coding skills to create a review game, a video of a non-fluent reader fluently reading a picture book, a volcano erupting in class, and the list goes on. I hope you take the time to explore Genius Hour on your own. Your kiddos will love you for it. As a classroom teacher, I was always looking for ways to make learning authentic and meaningful for my students. I had the over eager writers, always, who wrote pages and pages of stories. But, I also had the non-motivated writers. Those were the kiddos I was lucky if I could get a page, much less multiple ones. I know we all have had this problem as educators. I knew I was missing the boat somewhere. 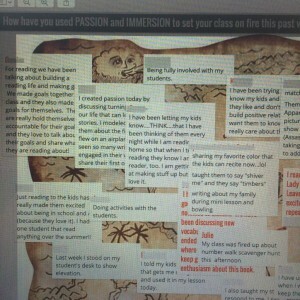 That’s when I stumbled upon student classroom blogging. What I really liked about this tool was the option to set preferences that I had to approve all posts and comments before they would be posted to our classroom page and/or student pages. This helped keep appropriateness in check and allowed me to use this tool for both formative and summative assessment purposes because I could get original answers/posts from students without their peers’ posts influencing them. I will say, I tried not to use for grading purposes. I wanted the kids to LOVE this form of authentic writing and for some, the grading aspect could have a negative effect on their effort and quality of posts. Kidblog does now charge after a certain amount of posts, and offers fantastic “bells and whistles” with the very reasonable updated price. There are many other blogging tools available for educator/student use that will offer the same learning experience as Kidblog. You can view them here from a recent presentation I facilitated. This blog, which I use as my weekly newsletter to teachers of the Mexico Public School District, is created using the blogging tool, Edublogs. It is an awesome free tool, but allows for more “bells and whistles” with the updated version. Here, I am able to import videos, images, hyperlinks, and text (as with the others). 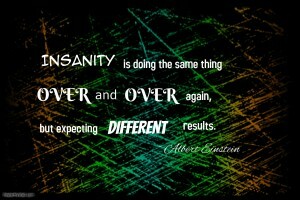 The only reason I didn’t use one of the above mentioned blogging tools, is because I wanted to try something different. They have all been great and such a wonderful opportunity to share ideas and resources with others! There are many resources out there to help you get started whether for your classroom/student use or professional use. You could even create a personal blog to share what’s happening with you or your family. Blogging is such a powerful and popular form of sharing information and resources with the public. If you really pay attention, most of the resources you may pin on Pinterest, share on Facebook, Twitter , and G+, probably come from a blog post. Others are blogging, why aren’t you? Share any ideas or ways you have used blogging in your personal/professional environment. You never know, your idea could spark someone else’s creative genius! I had the absolute wonderful experience of presenting, again, at the MOREnet Technology Conference in St. Louis. As I’m sitting through great presentations from awesome teachers from Missouri and surrounding states, it became evident there are LOTS of resources and digital tools to assist teachers in creating and presenting engaging activities to students of all ages. It was affirming to know that most of these tools were already on my radar and I was excited learning of new tools I could bring back to teachers in the district. There is nothing I enjoy more than hearing new, innovative ways digital tools are being used to enhance and transform instruction. What was clearly present, and mentioned in almost every workshop I attended, as well as my own presentations, was the importance of using digital tools to make learning better. Don’t just use the tool to use the tool. It’s important to ask yourself, “How is this tool going to make my lesson better? 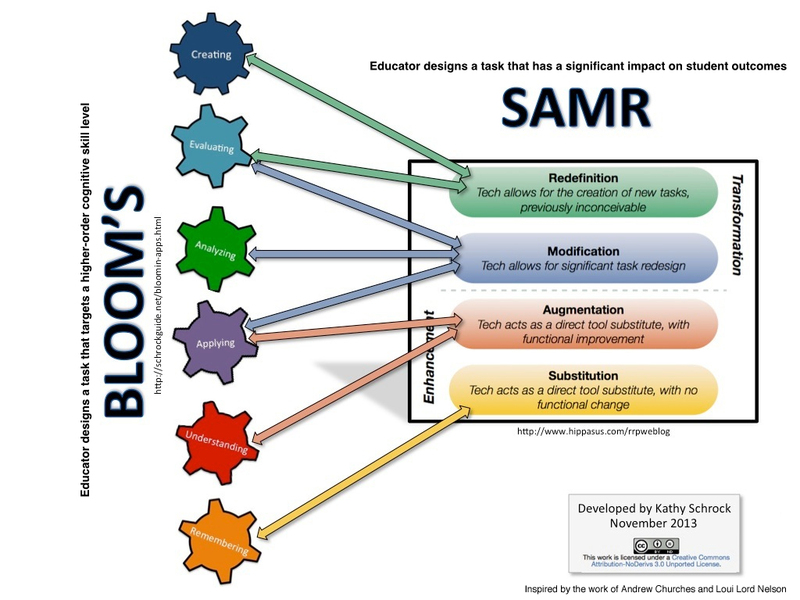 How will this tool increase the level of learning, understanding, and, most importantly, critical thinking for all my students?” Discussed and presented was the importance of using the SAMR Model of Technology Integration, to develop lessons that truly transform student learning. As the District Instructional Technology Facilitator, in every meeting, I stress the importance of “not using the tool to just use the tool”. It’s important to look at where the tool and lesson uses fall on the SAMR Model scale, and try to reach levels “above the line“. I challenged all the teachers at the beginning of school to find where most of their technology practices with their students fall on the SAMR Model, and try to increase 1 level. As educators, we all know there are times where activities at the bottom of Bloom’s Taxonomy, Webb’s DOK, and SAMR are necessary. But if we teach at those levels for the majority of the day/time, our students are the ones clearly suffering. We have all studied, to great length in most cases, the importance of increasing that rigor and critical thinking of students. And now, throwing technology into the mix, we are faced with additional opportunities to really promote critical thinking. I tell my teachers, if you could do this activity with a pencil, why use the computer? 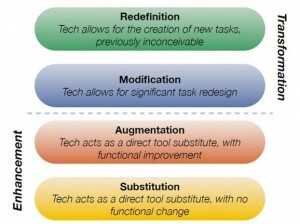 A represents the Augmentation level of the SAMR Model. In this level, the technology slightly makes the thinking and lesson a higher level of critical thinking/productivity. For example, now the student will use a speech to text app to help create their paper or story. This would not have been possible without the use of the technological app, however the level of thinking did not increase. 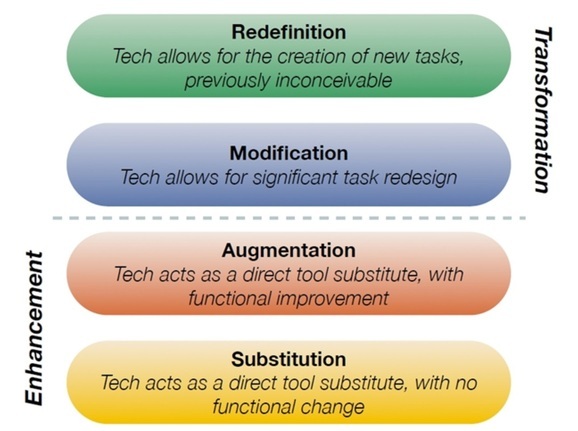 M is for the Modification level of the SAMR Model. Now we are working “above the line“. Learning opportunities “above the line” are challenging students to really use their levels of understanding and develop those critical thinking/higher order level of learning skills. An example would be having the students share their work with a peer, in another location, to have them comment and offer suggestions to make their paper/story better. Here the students are collaborating with each other, in real time, via the computer, and collaboratively creating a paper that is of higher quality than the traditional paper/pencil version. Through the use of the revision history, the teacher can then begin to determine the level of understanding each collaborator has in regards to editing/revising or the selected content material. R: Redefinition. 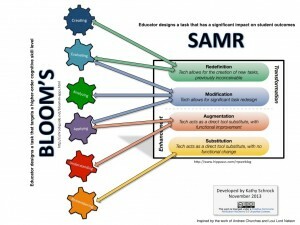 The final level of the SAMR Model. Here the task is significantly changed due to the use of technology. This activity could not be possible without the technology. A great example would be to take the created story/paper and create a podcast with the information gathered. This podcast could be put on the classroom webpage and shared with other students around the country/world. The students could collaborate with other students, who have listened to their podcasts, and debate/answer questions regarding their selected topic. Imagine the 21st Century skill opportunities! Collaborating and Connecting with others. The Creativity involved in the creation of the podcast, and the Critical Thinking necessary to defend/clarify comments made during the podcasts. All grade levels can use this model as a framework for technology integration. It will just look different between the Kindergarten and 9th grade classrooms. Is it a bit scary? Absolutely! But as educators we are ALWAYS looking for ways to engage our students in meaningful learning opportunities. 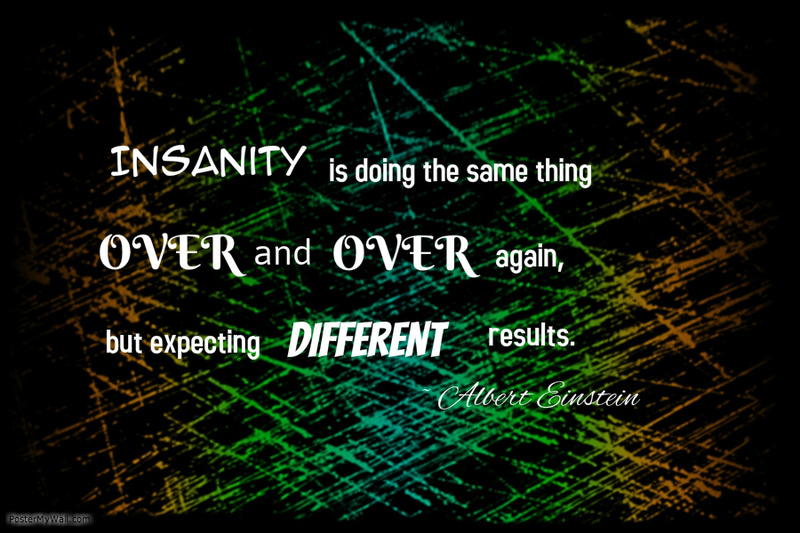 It’s time to step out of the “comfort zone”. Try shooting “above the line” in your technology teaching! So now, I challenge you the reader. Look at the resources shared in this post. Ask yourself, “where do most of my technology practices occur in the classroom?” How can you raise to the next level and truly work to create productive, engaged, critical thinking 21st Century students? Teacher will either create a new Kahoot or search for Kahoots already created and shared through the public Kahoot tab at top of the page. If the teacher wishes to create their own, they would choose whether they wanted to create a Quiz, Survey, or Discussion. Once the type of formative assessment is selected, the teacher begins adding their checking for understanding/review questions. The teacher will have a choice between adding text type questions, inserting images, or uploading videos to use for question prompts. The teacher will include answer choices (multiple choice) including the correct answer. The teacher will also have an option to award points and determine time allotted for each question. Once the questions have been created, the teacher will be given a GamePin. This will connect the students to the interactive quiz. To access the quiz, the students will go to the Kahoot site, enter the GamePin, and get ready to play! What makes this so engaging for students? The immediate feedback for each question. The students are awarded points depending on if they answered the questions correctly and how quickly they answered. What makes this so beneficial for teachers? It allows teachers an opportunity to see exactly where their students understanding lies within the content. By having each student/team actively login to the game, via the GamePin, the teacher has an idea of where holes in content understanding occur. Not only will teachers have an opportunity to access which students answered correctly and the fastest, but a breakdown of specific questions/student response is available. Want to use in a kindergarten classroom or with students who need visual/language support? Kahoot uses color and shape visuals for their answer choices. What an opportunity for reteaching either through whole class, small group, or one-to-one conferencing. By utilizing this formative assessment tool, teachers can collect information to help guide their instruction that students will actually enjoy. Below is a video tutorial on how to get started, create, and assess using Kahoot. As always please leave a comment and share any ideas/suggestions for Kahoot use. I Have a SMARTBoard! Now What??? What an educational resource a SMARTBoard, or interactive whiteboard, can be for the classroom! But, if you are using this as a projector only, you are missing MAJOR learning opportunities for your students. Yes, the SMARTBoard is an excellent projection tool, but it is also a way to allow your students hands-on opportunities to work with, manipulate, and create to deepen their understanding of content in the classroom. This resource has so many opportunities for whole group, small group rotations, and individualized learning. This post will share a few tutorials, and classroom applications that will not only help engage students, but promote 21st century learning in the classroom. One very easy application of the SMARTBoard is its use as a notetaker. I especially liked this use because I could save the important notes shared and written with students who may have been absent during the class period. By printing the notes, the students could add them to their notebooks, and have access to content/discussions missed during class. 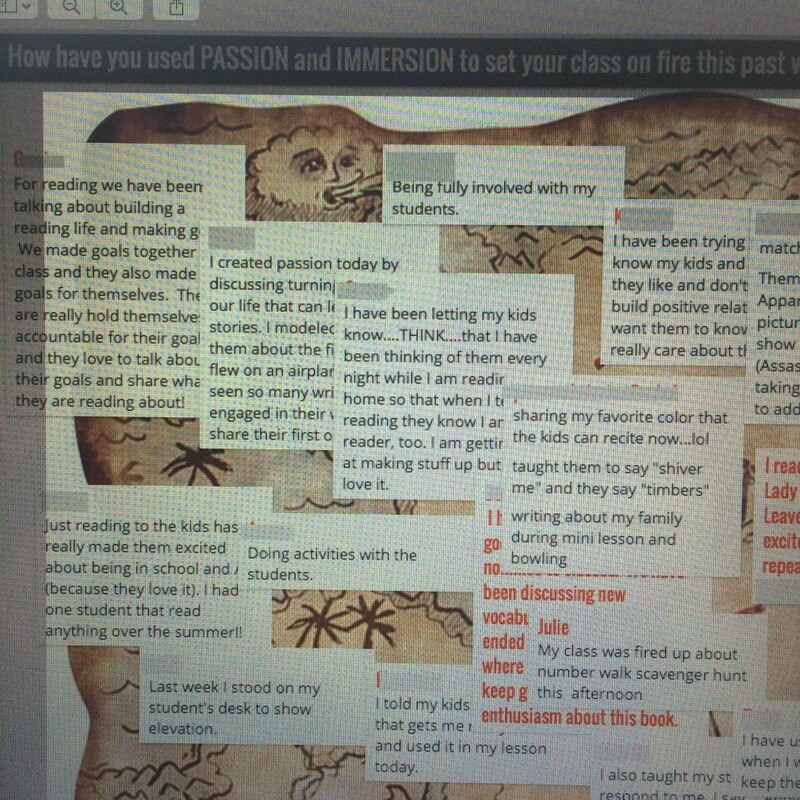 This also provided opportunities for interactive, shared writing by students. Whether primary or secondary classes, the note-taking capability allows all students to have a voice and participate in the sharing of content. Sorting and grouping activities also become a breeze with the SMARTBoard. These activities help promote higher level thinking in an engaging manner. Below is a short tutorial on how to set up a BASIC sorting/grouping activity. SMART Notebook also has many manipulatives, images, and templates, located in their Gallery, to help teachers create meaningful learning activities. Interactive learning tools, such as rulers, geometric shapes, compasses, protractors, geographic maps, and other images/resources are available for teacher use. The possibilities are endless in providing opportunities for meaningful learning!! One resource that cannot be ignored is the online SMART Exchange. Here is a compilation of interactive activities created for SMARTBoard use. You will find lessons created and submitted by educators from around the world. SMART Exchange provides many activities, grades Pre-K through 12th , in every content area. There is even a search option by content and learning objectives. SMART Notebook also has an activity builder that assists you in building learning activities to practice content. Simply choose the activity, plug in your information, and you are ready to go! Why recreate the wheel? Here are a few other suggested uses. Please let me know how I can support you in your use of the SMARTBoard to optimize classroom learning, student engagement, and higher order thinking skills! This week I started my new position with the Mexico Public Schools #59 district. My new title is the Instructional Technology Facilitator for grades Pre-K-12. To say this is an exciting time for me would be an understatement. However, I am still a little lost not getting a classroom and new resources ready for the new school year. You see, this will be my 1st year, without my own classroom, in 16 years. I will truly miss my 16 years as a 4th grade eMINTS teacher, but am so looking forward to supporting the teachers in this school district. What a way to reach more than 25 students each year, right? This week, I gave my 1st official presentation to the awesome new teachers of this district. The presentation was towards the end of the week. These new professionals were completing a very informational-packed week, and I wanted to provide them with a resource that was simple to use and easily adaptable to any grade level and/or content area. I chose the FANTABULOUS tool, TodaysMeet. Do you have any additional ideas? Please share in the comments below. I hope you found this tool useful!